History: (Fantastic Four: The World's Greatest Comics Magazine#12) - After Dr. Doom had stolen the power of Galactus, becoming a gigantic being in the process, the Fantastic Four tried to find a way to defeat him. 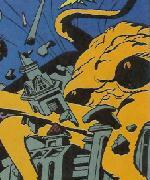 While in Doom's castle, Reed found the Ionic Inanimate Matter Converter, a device which could create beings out of nothing. 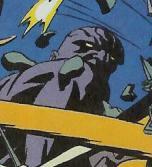 Using the device and the images of some monsters from the covers of comic books, Reed and the other three created four monsters with their minds which then attacked Doom. 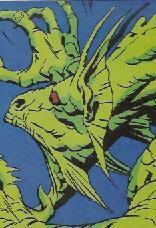 However, after a short battle, Doom defeated and destroyed all four creatures. Comments: Created by Erik Larsen, Eric Stephenson, Stan Lee, Steve Rude and Jorge Lucas. Based on characters created by Jack Kirby. Dr. Doom was familiar with all of the creatures as he had read comic books about them. Think about that for a moment. On that note, the comic book versions are, of course, just Earth-616's Marvel Comics having published books based on actual creatures. As per Susan in the issue: "(Reed) once told me that he believes those old Marvel monster magazines were based on actual events - actual monsters!" 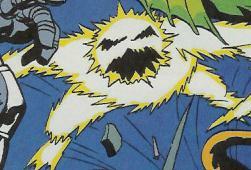 Along with the others, attacked Doom, but was easily repelled. A creation of Reed Richards stolen by Victor Von Doom, Richards found it in Doom's castle and, powered by the Silver Surfer's cosmic energies, used it to create duplicates of monsters from comic book covers. 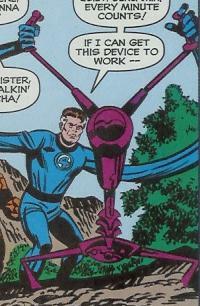 Along with the others, attacked Doom, but was easily repelled. This one was controlled by Ben Grimm, the Thing.